KIEV, Ukraine -- Road conditions in Eastern Europe are notoriously bad with Ukraine winning as worst in Europe. 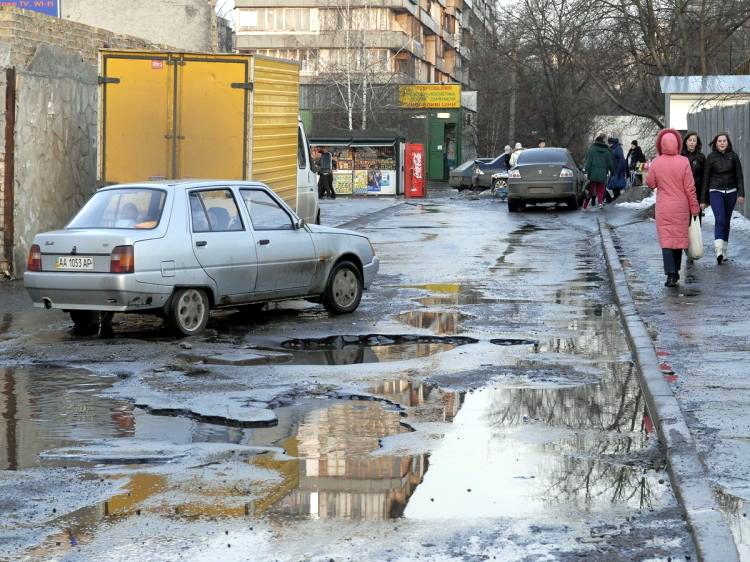 In Ukraine, over half of the roads are in an extremely poor condition, with potholes reaching meters in size. One of the streets in Kiev, capital of Ukraine. "When you drive, you have to look for your route as there is hole after hole. The roads are so bad in small towns, that your wheels are coming off,” said Anatoliy Krivenko, a Ukrainian driver who frequently travels to different parts of the country. Krivenko says that driving the roads in Ukraine is almost not doable because of all of the potholes. His car was severely damaged last winter, “I had to change a running gear and other parts. I have worn out the rotor four times,” he said. According to the Ukravtodor, Ukraine's national road service, more than 60 percent of the roads are in need of a complete overhaul, with 30 percent of those considered to be in state of emergency. To make matters worse, local and state roads in Ukraine have been increasingly damaged due to severe weather this winter. Temperature changes and the huge amount of snow on the roads caused melting water to penetrate Ukraine's poorly constructed roads, creating potholes of various sizes. Elena Slavinskaja, an assistant professor from Ukraine's National Transport University, says that the main reason for the poor road conditions is the lack of financing and the low quality of road construction methods. “The total amount of financing for the development of the public road network and its maintenance has consistently decreased,” Slavinskaja said. “The road conditions are directly related to the quality of road-building materials, primarily the asphalt bitumen which is made from low quality petroleum,” she says. The question of funding is a problematic issue for each sector in Ukraine. The reconstruction of the main roads is funded by the state budget, but this has not been developed yet. Road service workers are attempting to repair the potholes. Officials say that if there is enough financing, they can manage to repair the potholes by the summer. However, this would require roughly $800 million in funds. But according to Slavinskaja, who stated that Ukraine's roads are the worst in Europe, that would not solve the problem because the cracks would remain, through which water will once again penetrate creating new holes. With construction of new soccer stadiums for the 2012 Union of European Football Associations (UEFA) championship in Ukraine already behind schedule, Ukraine's poor road infrastructure makes things worse. The government has promised to meet the financing needed to finish the projects in time for the championship.